We knew that Amazon was looking for other ways to fill out the mapping components of the Kindle Fire without going to Google, because it just bought itself a 3D mapping company UpNext in July. Now, there’s additional indications that it doesn’t want Google in the maps slot, as Reuters reports that Amazon is hooking up with Nokia Oyj for maps on the new Kindle Fire maps app. The piece mentions that Amazon will be adding location capabilities to the next Kindle Fire, which could come in the form of either GPS or WiFi triangulation. Amazon, by the by, uses its very own fork of Android, highly customized for the Fire tablet. This means that it doesn’t get to bundle Google apps like Maps, as those are only offered to partners and the Google Maps app isn’t available on Amazon’s Appstore. This means that Amazon would have had to make a separate deal with Google in order to get Maps onto the Kindle Fire, something that it is likely reluctant to do. Nokia is a huge mapping provider already, making maps for its own devices as well as mapping apps for Windows Phone. 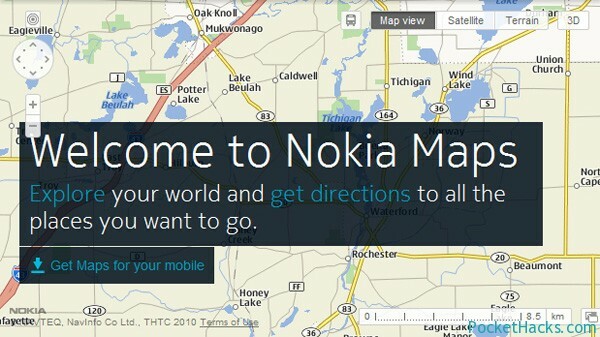 Nokia also includes its maps on Windows Phone partner devices like the Lumia 800 and 900. They’re actually quite pleasant to use, if not quite as sophisticated as Google’s offerings. Apparently, Amazon feels that they’re good enough to provide a mapping solution for its small tablets. I’m not sure how long-term a deal like this might be, though. There has to be a reason that Amazon bought UpNext, and it wasn’t to mothball it. It seems to be a safe bet that Amazon is still working on its own solution and that this partnership with Nokia might help it to get maps on its devices now until it can gin up a worthy in-house solution. Of course, the partnership with Nokia could be Amazon taking care of the nuts and bolts, while improving the overall service with UpNext technology, but Nokia already has its own 3D mapping solution. Google is set to lose a large partner with the release of Apple’s iOS 6, which contains Apple’s own mapping solution. The general consensus is that Google will release its own standalone version of Google Maps, like the one on the Play store, on iOS to serve users who would prefer it over Apple’s app. But It seems unlikely that Google would spin up a similar standalone app on Amazon’s Appstore as then it would effectively be condoning a fork which strips all Google apps and experiences from Android. On the other hand, there really isn’t much to lose here but face for Google and a few million extra maps users isn’t a bad thing. So this could very much have been a decision made on Amazon’s end to avoid Google gaining any toeholds on its flagship tablet. Two photos of potential new Kindles including a Fire were leaked to The Verge earlier today.